All of these easy salad recipes go together quickly making them ideal choices for when you need dinner on the table fast. You may not have a lot of time to prepare your meal, but you can still eat elegantly. Serve these salads as a separate starter course with a loaf of good bread and you will be enjoying a delicious, easy meal in no time. White beans are dressed in a garlicky vinaigrette and served on a bed of bib lettuce. Serve with garlic bread for a light meal. Beets are combined with comté cheese, bacon, and walnut oil, for a salad hearty enough to serve as a light meal on its own. A very popular salad "green" in France, endive can be made into a delicious salad in any number of ways. Here it is combined with oranges. A wonderful salad to serve with a summer barbecue or to brighten a dreary winter day. Shredded carrots dressed in a snappy vinaigrette. Céleri rémoulade is a French classic that you will find sold ready made all over France. Make it yourself with celeriac and homemade mayonnaise. Two recipes: one creamy and the other tart - both delicious and perfect accompaniments to grilled meats. An unusual salad green, dandelion combines with anchovies, Parmesan cheese, and shallots. Is this the secret to why women in France don't get fat? Fennel has a lovely light licorice taste that marries well with orange slices and red onion for a yummy vegetable salad. An ambrosial combination - figs served with fresh goat cheese makes a superb and easy salad. Made with tiny green Le Puy lentils, this easy salad is served warm and topped with goat cheese. Another vagetable salad recipe, this one features a little spicy something from cumin, cayenne pepper and garlic. 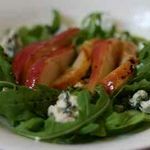 A wonderful combination of pears and Roquefort cheese topped with walnuts and served on a green salad. Although made with Italian Mozzarella cheese, no list of easy salad recipes would be complete without this - a favorite in France. Essential to creating you own green and vegetable salad recipes is learning how to make a good vinaigrette. Follow these tips for success. Chill salad plates, but not the salad itself. Many salad ingredients lose a lot of their flavor when cold. Get off the treadmill: look beyond lettuce and tomato. Try cubed cheese, olives, fruits, grilled nuts, lightly steamed or roasted vegetables, and unusual greens. And, of course, try some of the easy salad recipes above. Prepared salad greens can be a real time saver and a good introduction to more exotic greens. Avoid bottled dressings which are generally full of odd ingredients. If you have no time to fuss with dressing, just drizzle on a little olive oil and a few drops of flavored vinegar. High quality balsamic vinegar is an excellent topping for many salads.